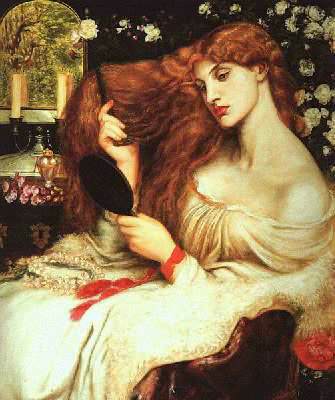 Left: Lilith, by Dante Gabriel Rossetti. osmarie Klier, in her reflections on Parsifal, notes that Wagner's Kundry exhibits, in her respective personalities, two female archetypes: the serving, self-sacrificing wife (Eve) and the wild, man- dominating woman (Lilith). The connection with Eve and Lilith is supported by Wagner's letter to King Ludwig in which he suggests ( but with considerable caution! ) an analogy between Adam- Eve- Christ and Amfortas- Kundry- Parsifal; and by Klingsor's invocation of Kundry as Urteufelin (first she-devil). Below: Lilith, by John Collier. ccording to the Rabbinic Talmud, Adam had a wife before Eve, whose name was Lilith. Her story seems to have been invented to reconcile the different creation myths of Genesis chapters 1 and 2. In chapter 1, man and woman are created out of the earth; but in chapter 2, Adam is alone, and so God makes Eve from his rib. The rabbis began with the Biblical reference to man's first creation as a bisexual being: male and female He [God] created them [the first human] . Some of the rabbis found in this image something similar to what Aristophanes proposed in the Symposium: a dual bodied being later divided into two who must thereafter seek each other out. But others tried to take into account the later creation of Eve detailed further on in the text. If woman was created from Adam, after his initial creation, than what happened to the female created at first? The answer, according to the Midrash, was that she was Lilith; created with Adam, she refused to comply with Adam's demand that she submit herself to him, and in the end fled from him by using the Ineffable Name. Adam then complained to God about his loneliness, and the creation of Eve followed, together with the Fall and the Expulsion from Eden. Adam, blaming this on Eve, separated from her, and for a time reunited with Lilith, before finally returning to Eve.